Most small and medium enterprises (SMEs) thrive on a mean and lean organization. They do not want to have a bloated organization because they cannot afford that fixed manpower cost. One of the predicaments of SMEs or even giant organizations is lactating mothers. Mothers who need to go to work, yet they have to take care of their newborn baby. For jerk bosses, this is not an issue: Either you come to work and deserve an honest day's pay or you're outta here. For real leaders, this is not an issue either because there are many ways of making their lactating mothers enjoy both work and motherhood. And they have an ally in Soroptimists. To spearhead this awareness and advocacy in cooperation with the Department of Health, in order to make women aware about the nutritional and health benefits of breastfeeding, both for infants and mothers. To help lactating women breastfeed their baby even if they are at work. Now on its 7th year, to continue this project in Barangay Addition Hills, with 40 children participants, ages 4 to 6, four times a week feeding sessions, for a duration of four months. Proper food and nutrition lectures are conducted for mothers during the feeding session while children are given learning time through nursery lessons. Soroptomist Mandaluyong received the "GAWAD NUTRISYON" award from the City of Mandaluyong, for this program. This is one of the leading advocacies of Soroptimists all over the world. The Philippine Region puts emphasis on this program—our country being a vulnerable source for human trafficking. To raise awareness among women in Mandaluyong, Barangay Plain-view. This is a continuing campaign and will be brought to other communities in Mandalu-yong as well. To help strengthen WCPD in its local community in various ways by donating office supplies and equipment, providing counseling and legal support; and giving stipends for policewomen to enable them to attend conferences on policing. In this manner, to help the law enforcers in upholding not only the dignity of women victims of abuse and violence, but also to help policewomen obtain appropriate tools to carry out their jobs. Some of our action plans are information campaigns in the workplace to increase awareness on domestic violence, livelihood projects in coordination with the Mandaluyong Manpower & Development Center and donations to the National Center for Mental Health and the Sanctuary Center. Soroptimist is a worldwide voluntary service organization of women in business and profession, with the common mission and commitment to improve the lives of women and girls in local communities and throughout the world, through the advocacies it promotes. To help these indefatigable ladies help your women employees and other women in depressed communicates, real leaders (both men and women) may partner with them in any of these projects. 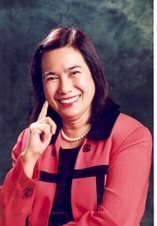 You may e-mail gigie.penalosa@vcpintl.com or call 743-3696 for any assistance you could extend to Soroptimist Mandaluyong. This is not only good for women, it is good for business, too. The other officers of SIM are PP Ma Baldus, PE Babes Dario, Vice President Lucy Regala, Secretary Norma Mendez and Nancy Uy, Treas Rosie Lardizabal, Auditor Juanita Chua, PRO Cla Lapus and Directors Perry Reyes, Ruth Flores, Maripaz Chua, Becky Sunga and Susan Nieva.